.......... I have finally gotten onto writing a little pattern tutorial for my granny softie I call Kitty Cat. Having said that, this is a fairly straight forward crochet make and if I could make it I'm sure all you clever people will find it a breeze. My original Kitty Cat (pictured above) used the Sunburst granny square as the tummy panel, in this example I am using a different square pattern, as I wanted something a bit more solid with less places for stuffing to poke through. You can use whatever square pattern you like as your tummy square, but I think the ones with less gaps work better for a stuffed softie. 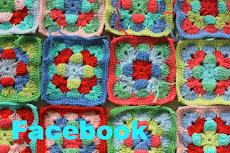 Ok, here is the square I am starting with, this pattern is called Spinner from the Jan Eaton Crochet Squares book, as I said choose whatever square pattern take your fancy and make 2 of them. The basic construction of this toy is a simple back piece and front piece that are the same, sewn together, with arms and legs sewn on last and the face hand sewn on and embroidered. I used a 3mm hook and 8 ply wool to make a nice thick piece of crochet to stuff. Round 1 of main colour : Ch 1, (acts as 1st st), sc in same stitch, then sc in each st around square, with 3sc in each corner st. When you get back to the starting point, sc in same st as ch1 and join the round with a sl/stitch. Next round : ch 1, TURN WORK and working on the back side of the square, sc in same stitch, then sc in each stitch around the square, working 3sc in each corner st. When back to the start, sc in first st and sl/st to starting 1ch to join the round. So now you should have a square with 3 rounds of sc bordering it. You now start working in rows back and forward to make the head. Ch1, (acts as 1st sc st so miss the next st) ,Turn work so working on backside, then sc in each st across til 1st corner, (end of row) then Ch 1, turn work, miss 1st st, sc in each st back across row. Next right side row, only sc 14sts, then ch1 and turn. Sc in each st back to start. 2nd RS row, Sl/st to next stitch, then ch 1 , sc in next 11 sts, (12 sts all up), ch 1, turn. Sc in each st back to 1st ch. Continue on in the pattern,( the sc in the middle will reduce by 2 each RS Row) until there are 2 st left. At this point bind off. Count 14 st from left hand side of work and join wool, ch1. Make 2nd ear the same way as the 1st. You can make your ears bigger or smaller depending on how many stitches you start with in your rows (depends on the square you choose to use), So this is really more of a guide, if you have a different amount of stitches and there is a big gap between your ears (I mean your softies ears!! I don't mean your brain space! haha!! I'm not being rude!) you can adjust the number of sts in each ear, just make sure they are the same number. I like to leave a gap of 3-4 st on my cat. So they should look something like this when done. Make another piece the same way for the back, and there you have it, the front and back of kitty cat! In part 2, I'll show you the arms and legs and face details and how it all goes together. Sorry this is in 2 parts, but it has taken me so long to get just this far that I think you would be waiting for ages if I did it all in one go. I think I'll be able to finish off the 2nd installment for you pretty quickly, and maybe even post it tomorrow! Thanks for this - something else for my infinitely long to do list! Thank you, Thank you, Thank you. Love the tutorial. I can't wait to get started. that's such a nice pattern !!! Thanks a lot ! Anyroad, shall go back and have a look at your tutorial. May be just the project I need to work on for our holiday. Thanks for the wonderful pattern. Is this pattern basically the same as the one for your owl birdies? I am new to your blog and am having so much fun going through older posts - you amaze me! This is such a cutie! 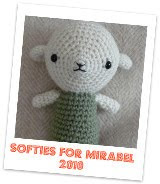 Thank you for such lovely photos and a cute project! I know a special person I need to make this for! Thanks so much, you are a creative genius!! I love this kitty. Is there a part two to the pattern? This is really great! I just love the colors :) If you get a chance to check out my blog I think you would like some of my free patterns. Thanks! Ooh lovely! One to add to my "to do" list! i love this little cat!! Kelly, did you find out what brand of yarn she is using? I really want to know too! Well done, great tutorial, keep up the great work with your crochet. Love this and so many of my friends and family have commented on my Pinterest post. I can't seem to locate Part 2. can you direct me please? I've got the crochet bug again and when looking for some baby ideas I found your great cat (on Tipnut) and HAVE TO MAKE...for myself..haha...(we'll get back to the baby later). Your Kitty Cat just makes me SMILE! Thanks for the great tutorial...can't wait to get started! Me encnatan todos tus trabajos, son muy amoros y la forma de explicar que tienes, te felicito. 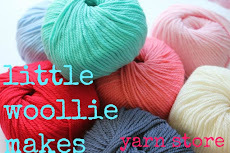 I love your choice of colours - do you ever list the yarn colour/brand/etc? I made a kitty cat from your tutorial just over a year ago and gave it to my youngest daughter. It sat around all this time, not being played with and then a few weeks ago it became her new favourite toy. She takes it everywhere with her and cannot sleep without her kitty cat :-) Just wanted to say thank you for the tutorial from myself and a very happy 2 year old! I don't see any mention of the size of the starting granny squares or the finished size of the kitty. I know they will vary, but I would appreciate a suggestion of where to start. Thanks. I'm using it in my CAL group for October. I'll be back to show you all of the Kitty Cats that are created using your lovely work. Lovely Cat!! and thanks for the tutorial but it would have been great if you would also have given the tutorial or picture with working stitches of the square granny, I'm here trying to find out the count of it and how big is the sq?? have you got the sq tutorial somewhere else?? I love your owlies, I have many of them for my children as key holders so nobody looses his keys now! Hi, LOVE this tutorial, such a cute, sweet and unique idea. Definitely would make a wonderful gift for that special little girl. I love handmade items!